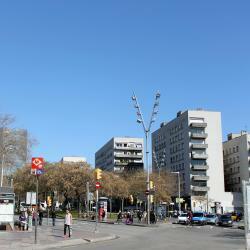 Looking for hotels near Parc del Forum? Featuring city views, Apartamento Moderno Diagonal Mar has accommodations with a terrace, around 2.7 miles from Sagrada Familia. Located in Barcelona, Motor Yacht Boatel has accommodations within 3.1 miles of Port Olympic. Complimentary WiFi is provided. Barcelona Princess Hotel is a 10-minute walk from the beach in the city’s Forum area. It offers wonderful views, a free sauna and a gym. Free WiFi is available throughout. 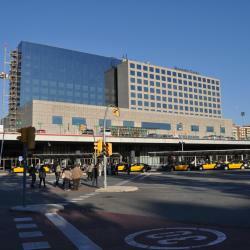 AC Hotel Barcelona Forum is located opposite Diagonal Mar Shopping Center, at the end of Avenida Diagonal. It offers a rooftop pool and modern rooms with Mediterranean Sea views. Hotel SB Diagonal Zero Barcelona is opposite Barcelona’s International Convention Center and Barcelona's Forum Auditorium. This hotel is next to Diagonal Mar Shopping Center and just 1312 feet from Nova Mar Bella Beach. It offers a seasonal outdoor pool, a fitness center and air-conditioned rooms with a LED TV. 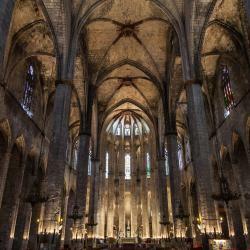 Hotel SB Glow **** Sup is located in Barcelona, 1.2 miles from Sagrada Familia. A sauna and a bicycle rental service are available for guests. Brand new hotel, staff very friendly and helpful. Located in Barcelona, 2953 feet from Port Olympic, ibis Styles Barcelona City Bogatell features private parking and free WiFi access. Everything was perfect. The staff helped me with a surprize for my girlfriend's B-day. Vincci Bit is a modern, stylish hotel located just 10 minutes’ walk from Mar Bella beach. The breakfast was incredible! Location is very close to the beach. Staff is very helpful. This design hotel is located 15 minutes’ from the beach, in the 22@ business area of Barcelona’s Poble Nou district. • Close to Marina and Bogatell metro stations. Leonardo Boutique Hotel Barcelona Sagrada Familia is located just 15 minutes’ walk from Gaudí’s famous Sagrada Familia. The staff were friendly, helpful and sensitive to our needs. This designer hotel offers a free gym, steam bath and a roof terrace with a children pool, a seasonal outdoor pool and views of Barcelona. I like everything. Yhe staff were very polite and helpful. The room was confortable and clean. Located 984 feet from Barcelona’s Nova Icaria Beach, Hotel SB Icaria Barcelona offers a gym, sauna and outdoor pool with sun terrace and hot tub. Rooms include free Wi-Fi and flat-screen satellite TV.... Location, food, staff, decoration. Vincci Marítimo is a 10-minute walk from Barcelona’s Diagonal Mar Shopping Center and the CCIB Convention Centre. It has bright, stylish rooms with flat-screen satellite TV and free Wi-Fi throughout. Very friendly and helpful front desk staff! Very relaxing room and atmosphere all around. Located on the seafront in Diagonal Mar, the Hesperia Barcelona del Mar (formerly Hesperia del Mar) features stylish rooms with free WiFi and satellite TV. It was close to the beach and easy taxi for site seeing. Catalonia Albeniz offers spacious, air-conditioned rooms with free WiFi and satellite TV. 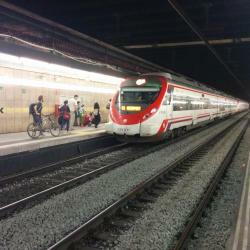 It is located 492 feet from Clot Train Station, and a 15-minute walk from Gaudí’s Sagrada Familia Church. We stayed here at Catalonia Albeniz for 3 days 16.09-19.09. 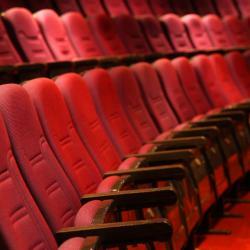 Hotels with great access to Parc del Forum! The Gates Hotel Diagonal Barcelona is a chic hotel set next to the Torre Agbar Tower. It has an impressive roof-top pool, free internet access and a restaurant. The room was amazingly comfortable, the bed, was just too good to let go. Four Points by Sheraton Barcelona Diagonal is just under a quarter of a mile from Glòries Shopping Center, in the modern 22@ district of Barcelona. This hotel answers all the needs of a traveller. 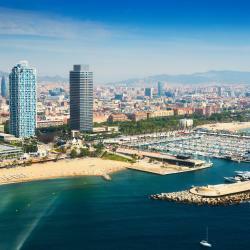 H10 Marina Hotel Barcelona is 10 minutes’ walk from Barcelona’s Olympic Port. It offers a gym, spa and free Wi-Fi. The rooftop pool and sun terrace offer fantastic city and sea views. Room was large and very clean. Loved the minimialiatic decorating. Ibis Barcelona Plaza Glòries 22@ is in Barcelona’s Glòries district, just over a quarter mile from Torre Agbar. It has a fitness center, a 24-hour bar and soundproof rooms with a flat-screen TV. Great location and a lot of facilities around it. 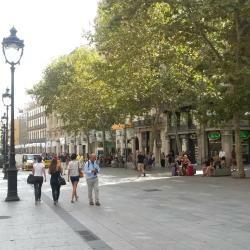 A 15-minute walk from Gaudí's Sagrada Família, Catalonia Sagrada Familia is just 984 feet from Clot Metro and Train Station. It features a restaurant, a seasonal outdoor pool and a gym. It was a pretty good location and walking distance to a lot of sites.